Put on your oven mitts, fire up your stove and get ready, set, cook! This week’s featured dish is fondues! 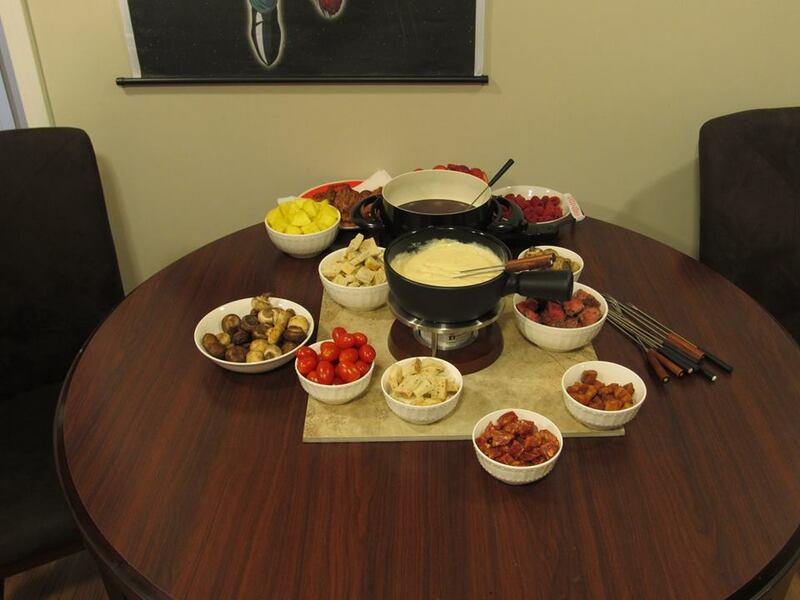 Fondue first reared its head in 1699 in Germany as an explorative way to enjoy melted cheese infused with wine. At that time, only breads were used as dippers in this delicious invention. It moved through the region, being adopted by the french whom prepared their fondues with an egg base making it more of a souffle than a dip. During World War II, rationing of food created a drop in cheese consumption and countries such as Switzerland, a top producer of cheese, were failing. They brought back the original pairing and pushed fondues through marketing schemes and sold to the armies to up the sales of cheese, also naming fondue as their country’s Unity symbol. It finally made its way to the United States in the 1950’s and the “melting pot” of America started branching off new forms of fondue, such as the popular chocolate fondue and the current favorite of bourguignonne, which is roughly deep frying meats in a fondue pot of hot oil. I love all adaptations of fondue! So have your cheese and wine and breads too!